I have been thinking a lot about our planet lately. Our connection to the sun and the other planets in our solar system are mysteries we have yet to truly unlock. 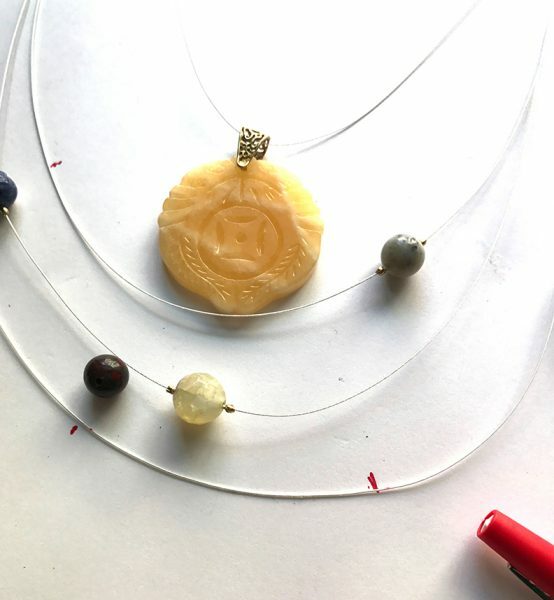 With these thoughts in mind I attempted to create a necklace that would showcase our solar system in a necklace. I felt like I was back in high school as I tried to remember the order of our planets and what their most basic colours were. The first step was to find beads that would resemble the planets. Happily, my company John Bead Corp has a rather large selection of semi-precious beads. Our solar system has eight “official” planets, which orbit the Sun. 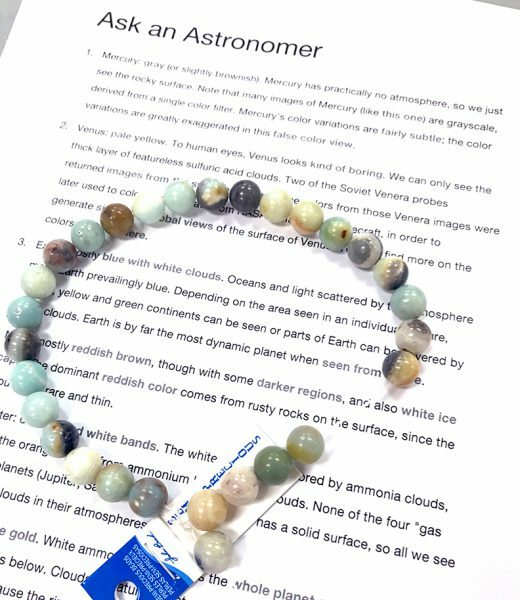 I reviewed the planet colours on “Ask an Astronomer” and selected the matching semi-precious beads that would work best on my necklace. Amazonite beads are usually in a mixed color strand. You will find beads that are pale blue to brown with this gemstone. 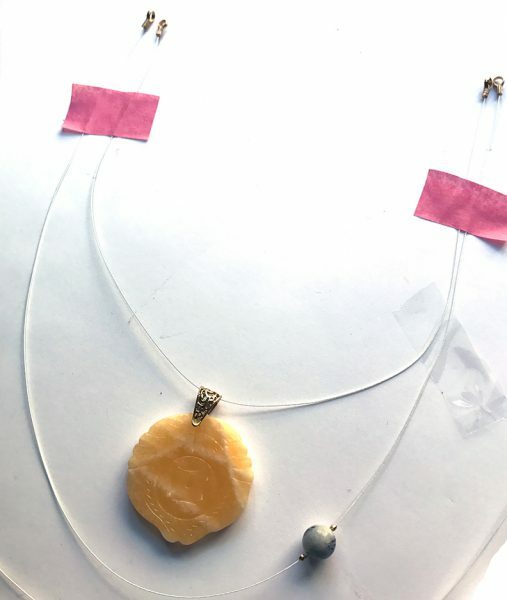 I also used yellow jade for my gold Saturn, red jasper for Mars, agate for orange and white Jupiter and some sodalite for Earth’s white and blue. 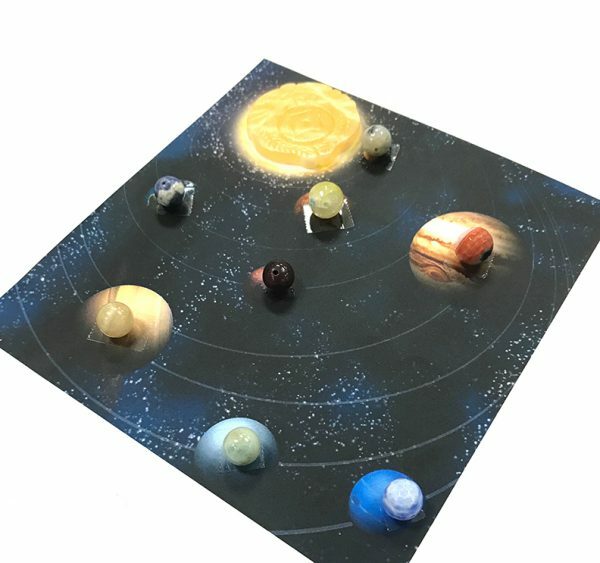 The planets, in order of their distance from the Sun, are Mercury (Gray), Venus (pale Yellow), Earth (blue and white), Mars (reddish brown), Jupiter (orange and white bands), Saturn (pale gold), Uranus (pale blue) and Neptune (pale blue). 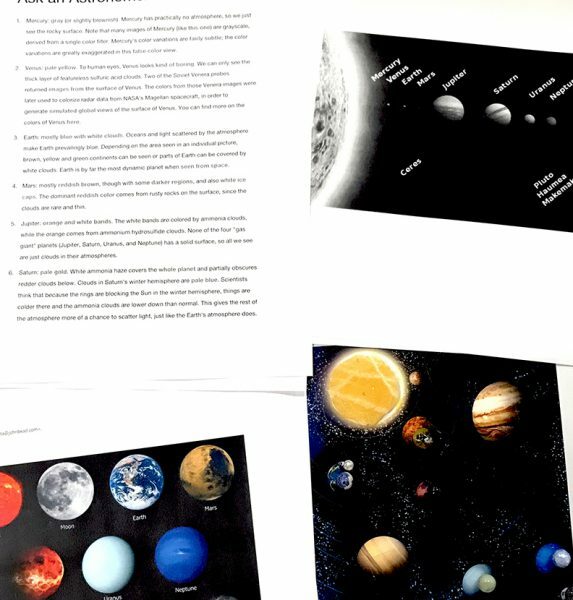 This printed solar system became my template. I did not want too much empty space in the middle of my piece, so I went with five strands instead of eight. I chose a pretty yellow jade pendant for my sun. I knew the first strand on this tiered necklace needed to be centered properly with a focal piece. 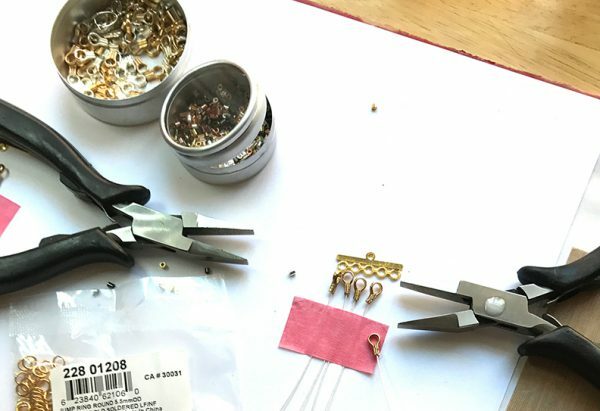 I used a good beading wire to create all five unique tiers. 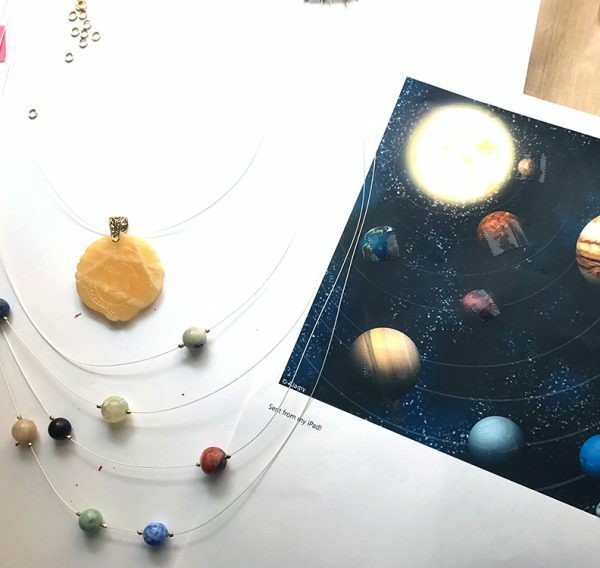 Once the first tier was measured and the pendant was in place, I was able to set all the planets in locations similar to how they looked on my printed solar system map. My rough measurements for strand lengths did not help. I quickly realized my strands were going to need tweaking and I had to “eyeball” each tier. Since I needed to see where each “planet” would be set it was easier to set aside my ruler and use my own judgment for the right lengths. In order to ensure that each tier would hang properly I needed to cut slightly longer lengths of stringing wire so I could add or subtract wire depending on where my planets were. Taping my tiers was a very helpful part of the process. 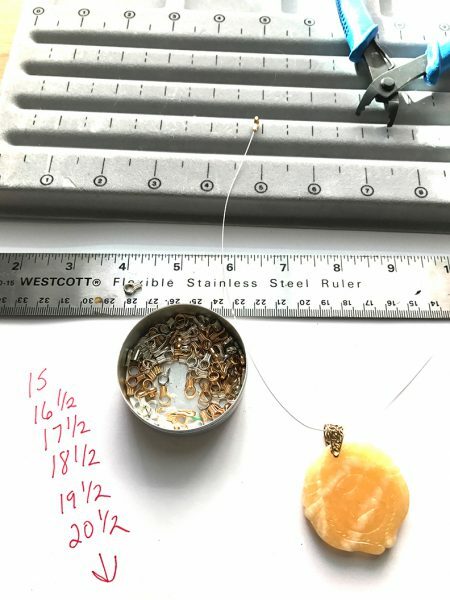 When I figured out where a planet needed to be, I marked my wire, set a crimp in place and flattened it. Then I strung my bead and placed and flattened a second crimp to keep it secure on the wire. For tier two, I only had one bead to set. I finished both ends of each wire with an Ez-Crimp. I taped each tier to my board to keep the strands sorted and the wire properly shaped. I used jump rings to attach all my finished tiers to five-hole coupling bars. A lobster clasp and jump ring completed the necklace. It was fun and relaxing to get all the beads set. I started to get really good at flattening my crimp beads too! 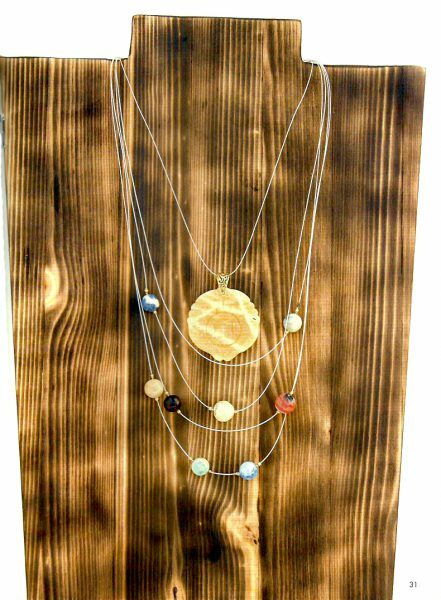 I think my finished necklace does indeed resemble our solar system!